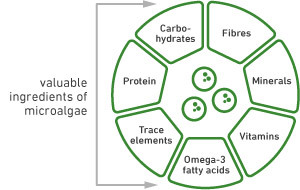 Micro-algae are true power packs. They contain high-quality organic content, which includes: protein, carbohydrate, fibres, vitamins, unsaturated fatty acid, as well as mineral nutrients, and trace elements. In addition, algae yield remarkable productivity rates by converting light and carbon dioxide (CO2), into valuable organic product and oxygen. What are the health benefits from algae? These green vital packages are raw material for a lot of important substances, such as high-quality protein, carbohydrates and omega-3 fatty acids. This high-quality biomass is used in the pharmaceutical, food, cosmetics and energy industry. Algae represent an asset for our human health. They support our metabolism, contain magnesium for our nerves, iron for the blood formation and vitamin C for our immune system. Algae are especially valued because of their ability to decompose heavy metal and poison. It’s the best detox out of the nature! What are health benefits from algae? Today they are found already in countless products everybody knows such as jelly babies, pudding, lemonade, noodles and so on. As food supplements they are offered as pills or as powder. and a lot more unexplored potential ! Algae is a valuable resource for the pharmaceutical and cosmetics industry. Vitamins and beta-carotene made from algae activate our skin, protect her from environmental factors, combat free radicals and act as natural anti-aging-complex. Alginates made of dulses or brown alga are used in compresses for the wound care. In addition algae are also an ingredient of toothpaste.